Iraq is a Western Asian country that is bordered by several other countries. 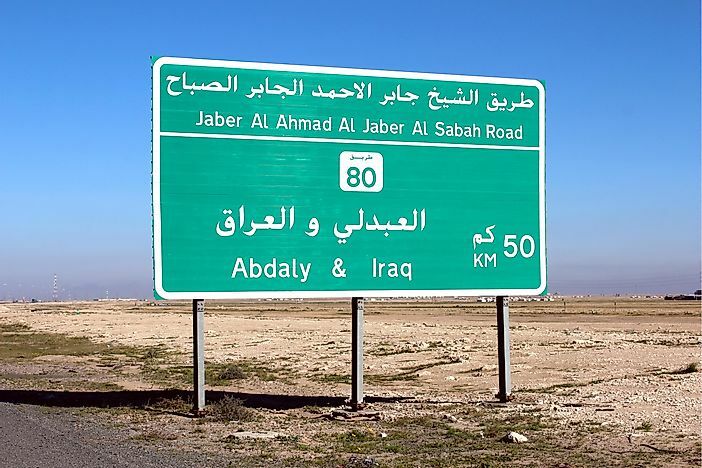 A road sign advertising the Iraqi border in Kuwait. Iraq is located in the western region of Asia and is part of the area commonly referred to as the Middle East. Here, it covers a total area of 168,754 square miles that is comprised of the upper and lower Mesopotamian plains, the Arabian and Syrian Deserts, and the Highlands region. Only 370 square miles of its territory is covered in water. This country has a population size of over 37.2 million, the majority of whom identify as followers of Islam. The territory of Iraq is bounded by 2,403 miles of borders. Of this distance, only 36 miles are located along the Persian Gulf coastline. Before its borders were established, Iraq was controlled by the Ottoman Empire. Today, this country shares international borders with 6 countries: Jordan, Kuwait, Turkey, Syria, Saudi Arabia, and Iran. The shared border between Iraq and Jordan stretches over a distance of 111 miles, making it the shortest international border in Iraq. It is located to the western edge of this country, just where a smaller area extends to the west from the rest of the territory of Iraq. At its northernmost point, this border begins at Syria and runs south until it reaches Saudi Arabia. The only official border crossing between these two countries is known as Karameh in Jordan and Turaibil in Iraq. In 2015, it was shut down by militant groups on the Iraq side and 2 years later, was reopened when Iraqi military troops took control of the region again. The shared border between Iraq and Kuwait measures at a distance of 158 miles, making it the second shortest international border in Iraq. This border lies along the southeastern region of Iraq, and prevents this country from having a larger area of access to the Persian Gulf. It begins at Saudi Arabia and turns northward, into the territory of Iraq, before turning in an eastern direction and curving slightly to the south. It ends on the coastline of the Persian Gulf. The majority of this border (122 miles to be exact) is marked by an electrified fence, the construction of which was prompted by the UN Security Council. It is meant to prevent Iraq from invading Kuwait again. On the Kuwait side of this barrier, authorities have dug a ditch the reaches 15 feet in depth. On the other side of this ditch is an additional dirt wall that reaches 10 feet in height. Additionally, this border barrier is heavily guarded by military personnel. The shared border between Iraq and Turkey runs for a length of 228 miles and is situated along the northernmost region of Iraq. This border begins at a tripoint shared with Syria and Iraq. From here, it moves in an eastern direction before reaching the border of Iran. This border is home to the Ibrahim Khalil border crossing, which consists of a bridge over the Khabur River. This river serves as the physical boundary between these two countries. The Ibrahim Khalil border crossing was previously administered by the Kurdistan Region, an autonomous area within Iraq. In October of 2017, the government of Iraq took control of this crossing point in response to the results of a Kurdish election, which supported official secession from Iraq. The shared border between Iraq and Syria stretches across 372 miles and lies along the northwestern region of Iraq. This border begins at a tripoint shared with Jordan and Iraq. From here, it heads in a northeastern direction until it meets the tripoint with Turkey and Iraq. This border largely follows the boundary that was established under the Ottoman Empire, although its current specifications are officially laid out in the Anglo-Iraqi Treaty of 1922. In 2014, the Islamic State of Iraq and the Levant (also known as ISIL) took control of large sections of this border. The northern section of this boundary lies along the autonomous Kurdistan Region. Only 3 locations along this border are considered official border crossing points: Al Waleed, Rabia, and Semalka. The shared border between Iraq and Saudi Arabia measures at a distance of 504 miles and makes up most of the southernmost border of Iraq. This border begins at the southern tip of the border with Jordan and from here, continues in a general southeastern direction before meeting the tripoint shared with Kuwait and Iraq. Because of increasing instances of violence caused by ISIL in Iraq, the government of Saudi Arabia decided to invest in the construction of a physical barrier to separate these two countries and prevent armed groups from crossing. This project went underway in 2014 and today, covers the entire border. Like the barrier between Iraq and Kuwait, this one consists of a tall fence which is flanked by a deep ditch and dirt wall on the side of Saudi Arabia. To increase the security, the government of Saudi Arabia has also installed the following: 78 lookout points, 32 quick response offices, 10 security vehicles to run the length of the barrier, and 5 separate layers of fencing. The shared border between Iraq and Iran stretches across a distance of 994 miles, making it the longest international border in Iraq. It is located along the entire eastern edge of this country. This border begins at the end of the eastern tip of the border with Turkey and from here, moves in a southern direction until reaching the coast of the Persian Gulf. The history of this boundary dates back to at least the 17th century and its exact location does not follow conventional methods of measurement. Instead, the border arrangement between these two states mention that the border begins at the Persian Gulf and is to be determined by where the low tide falls. Iraq and Iran share 9 official border crossings, 4 of which are within the autonomous Kurdistan Region. Although the governments of these two countries have reached consensus on the location of this shared border, some disputes are ongoing. Primarily, neither country agrees on the appropriate use of the Shatt al-Arab, a 120-mile long river that forms the southern end of this border. What Continent Is Iraq In?